by Scott & Cathy Sibley. Softbound, 91 pages, 11" x 8-1/2". This magnificent new how-to book is heavily illustrated with close-up, full color photographs. 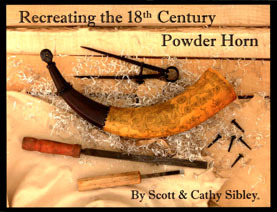 Renowned powder horn maker Scott Sibley demonstrates every aspect of selecting, fitting, shaping, carving, finishing, and polishing a fine powder horn. Special emphasis is given to F & I War era, Revolutionary War era and Southern horn styles. Scrimshaw artist Cathy Sibley continues this in-depth study of horn making by demonstrating the simple tools, techniques, and layout planning needed to skillfully engrave correct period folk-art or formal scrimshaw decoration. Includes a gallery of photos of highly collectible Sibley horns, and original antique horns from the collections of Scott Sibley and Jim Dresslar.